"You shouldn't get a headache from this, your head might just feel weird or different." Words spoken by Mr. Virgil Barrow. .......I might not have a headache but I definitely feel like I've been hit by a train....I woke up at 11:30am this morning and went for an afternoon nap at 1:00pm. Training is definitely picking up! Rewind back a couple weeks when Virgil mentioned that we were going to be making contact and that I needed to purchase a head gear... Pardon me? How has this day already come? I had an initial freak out in my mind, asked myself why I was doing this (for the 100000 time) and then calmed down. My next move was to tell everyone I knew, that I was going to be getting punched in the head for the first time! I thought it sounded pretty badass (excuse my language). And it totally is! 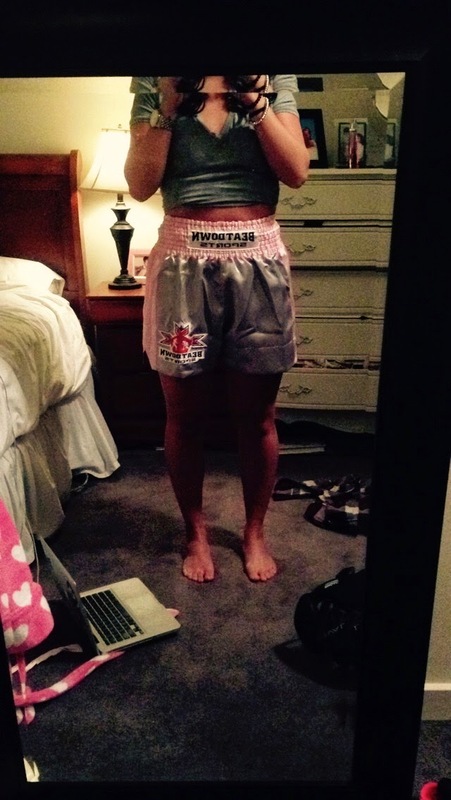 I was excited to get to the boxing store and shop (I love to spend money- sorry future husband). My experience at Beatdown Sports was a good one. I would have loved to have been able to hear what the guy at the store was thinking when he saw me walk in and say "I'm looking for a head gear thing or whatever..." to which he laughed and said "A head gear?" and then I proceeded to ask him if he had any in the colour pink...He couldn't contain his laughter in front of me... BUT it got me a free pair of pink boxing shorts! Yesss!! How cute are they? I left the store with a black head gear, black Asics boxing shoes and my new shorts of course. :) Thanks Beatdown Sports! I got to the gym on Saturday morning having had the most restless sleep the night before and felt SO nervous for what was in store for us. I was excited to get into the ring and really experience how it all feels with my equipment on, but when I saw Jane, Dawn, Rob and Mark waiting on the sidelines ready to take us on, my entire body was flooded with the most intense emotion. All I was thinking was "I don't want to get hit in the head." This gave me ALL the motivation I needed to really focus on the task at hand and defend, defend, defend. Virgil had us stand in a circle and hit ourselves in the head to take away the initial shock of someone else hitting us for the first time. I felt so weird standing there punching myself but I think it actually helped. The first hit was still a shock but our opponents were definitely not winding up and giving us their most powerful shots either. For the most part, the hour class was successful. I got hit multiple times but I learned a lot about my style and technique and things I definitely need to work on. I think I know what my strength will be but I'm not about to disclose this to Erica (my opponent)! I got really frustrated with Virgil who was OBVIOUSLY only trying to help me and proceeded to apologize profusely to him afterwards. He claims he "gets" me now, so maybe that needed to happen. All in all, I left the gym on Saturday feeling good! No tears and limited frustration. I got home, took a shower and fell into bed for a good chunk of the afternoon. I am ready for the next three + months to consist of A LOT of hard work and naps.